This entry was posted in cheesecake, Desserts, Holiday Foods and tagged cheesecake, dessert, holiday foods by Janet. Bookmark the permalink. Wow….this cheesecake sounds amazing! I can see why you didn’t want to change the recipe! I would love a large piece :)! I am the same way about recipes though, always changing them ;)! I love that you taught yourself to bake! thats pretty incredible. this cheesecake looks amazing. Well, it must be cheesecake week since I just made one over the weekend. Mine is a ricotta style but I usually love the creamy ones. Yours looks great! You are so FAR beyond me. Do you know what I made when my mom was at work? Also, I want this cheesecake. I love mascarpone in cheesecake – well in just about anything. I almost always have a tub in the fridge nowadays because there is just so much that you can do with it! 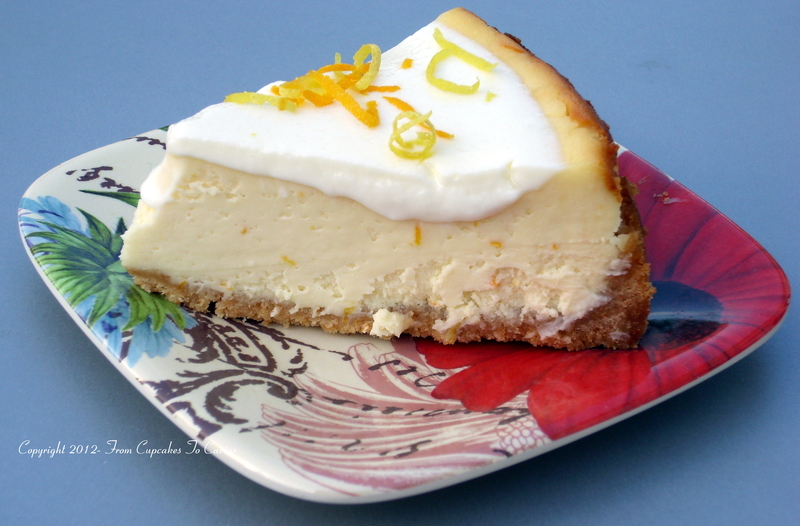 Mmmm love the orange zest addition, I bet that makes this cheesecake extra delicious! It looks so incredible, nice a tall, creamy & just plain out yummy! Great job! Just as awesome in fact as this delicious cheesecake – I have never tried marscapone but you give me incentive to try! When I was a kid my mom ruled the kitchen, so I did not bake or cook that much. Even today she cannot sit by passively why anyone cooks or bakes. You were lucky to have the opportunity to experiment in the kitchen at such a young age. For you to post a recipe that is un-tweeked, is definitely a clue that it is mighty delicious. Ha-funny that the son is slowly savoring his piece, you must have run low on pieces very quickly. Now I am wondering who moves their fork with all the talent of the Nascar driver when the dessert is presented…. This looks fabulous. Cheesecakes can be so finicky. The marscapone must add a beautiful richness to the cake. That cheesecake look so good! I also started cooking when I was really young, even though my mom loved to cook I always did it by myself. You turned into real baker..One thing I can’t make is cheesecake, I mean good cheesecake..no matter how many times I look in the cookbook or watch a video never turn into cheesecake if you know what I mean LOL!..so you are gifted my friend! Mmmmmmmmm now that looks incredibly delicious and decadent. Creamy = good. Mascarpone = better. Cheesecake = OMNOMNOM. The cheesecake looks amazing and I’m glad you found the right recipe for the marscapone. I also think you ARE a genius for making a pound cake at such a young age! This cheesecake looks killer!!! YUM! That is one beautifully creamy cheesecake–I’m sure it tastes delicious with that hint of orange. I can’t believe you made cake as a kid without a recipe, and it worked (sometimes)! That is awesome! These cheesecake sounds creamy and wonderful! Ohh, I worked at Bertuccis and their mascarapone cheesecake was to DIE for. Never tried to recreate it because I assumed it was ALL mascaropone, and it’s expensive. But doing mostly cream cheese seems like a good idea! I learned to cook when I was younger as well. I so loved trying different things! This cheesecake looks great and I have wanted to try marscarpone in a cake. YUM! Nothing like musically inspired food! I love cheesecake and I love Louis, so undoubtedly, I loved this post!